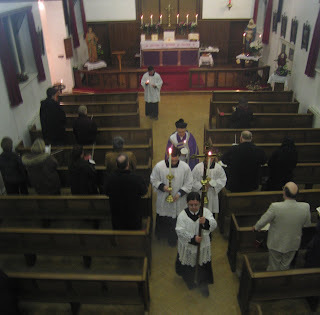 On Friday 2nd Februrary, Fr John Saward celebrated the Feast of Candlemass at his church of SS Gregory and Augustine. It was coincidental that it fell on the first Friday of the month, and so fitted in with our regular monthly Traditional Mass in that church. Mass was preceded by the blessinng and distribution of candles. These candles are taken home by the faithful and can be burned on occasion of need: a traditional use is during childbirth. They are, therefore, a sacramental: a blessed object which gives the user a special opportunity for gaining favours. Other examples are the palms blessed on Palm Sunday, the Ash blessed and used on Ash Wednesday, and sca pulars and medals accorded special blessings. 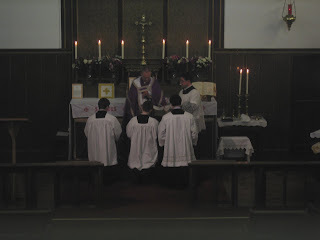 The very next day, Saturday 3rd Feb, is the Feast of St Blaise, and at the regular First Saturday Mass in Reading, Fr Olivier FSSP performed the ceremony of the blessing of two candles, which are then used for the blessing of the throats of the congregation. This is another venerable tradition of the Church involving sacramentals, and the beautiful blessings are worth reading. 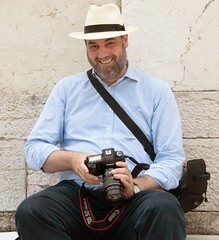 The sacraments work 'ex opere operato' ('by the work worked'), which means that when the minister of the sacrament uses the correct words and has the correct intention, we know God will perform a certain thing (transubstatiate the bread and wine; confer the character of baptism or priesthood, etc.). The faith and moral worthiness of the minister (the priest etc.) do not impede this in any way; on the other hand, the grace received by the person receiving the sacrament depends on the faith and worthiness of the recipient. A sacramental works 'ex opere operantis' ('by the working of the worker'), both of the individual and the Church. There is no metaphysical change, like transubstantiation, at issue, and the only issue is the reception of favours by the person using the sacramental, which depend on the user's faith and worthiness. The point of sacramentals is that they are privileged opportunities for us to receive favours. Just as there is a special point in asking for a favour at a shrine, so there is a special point in asking a favour in using a sacramental. The reason for this special opportunity to obtain favours at a shrine is that God, wishing to honour the saint honoured in the shrine, wishes to grant favours to those praying at it. Similarly with the sacramental, God hears the prayers of the Church spoken over the blessed object, and wishes to give honour to the Church by granting favours through the blessed object. For more on Sacramental see here. There are several excellent pages on Sacramentals on Fisheaters; here's one. receive the greatest possible favours through them!